Having braces should not cause any major changes in your day-to-day activities. You can still dine out, sing, play a musical instrument, or have pictures taken. With proper care and maintenance, you can promote your oral health while on your way to a more beautiful smile. If you play a wind instrument, several companies make mouth guards and lip protectors, although you may not need them. For certain sports it is a good idea to wear a mouth guard. Ask us about recommendations based on your specific needs when you come in for your next appointment. Flossing is an important part of good oral hygiene. With braces it may take a little more time and practice, and a floss threader may be necessary to get the floss under the archwire. Make sure you clean along and under the gum lines with floss each night before going to bed. After you have properly brushed and flossed, your braces should look clean and shiny, making it easy to see the edges of the braces. Dental wax can be very helpful with any areas that are irritating your mouth or gums. This can be especially helpful at night when sleeping when your mouth may get drier than during the day time when you can regularly hydrate. 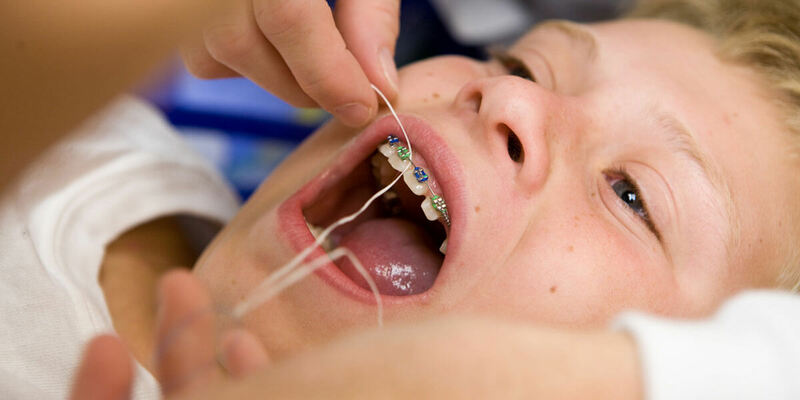 During orthodontic treatment the doctor may use elastics to assist your braces in making adjustments to your teeth and bite. Also known as rubber bands, elastics are typically attached to brackets on the upper and lower teeth and use tension to create changes in the teeth and bite. You should always wear your elastics as directed. You may remove your elastics when eating and brushing, and you should always replace your elastics with new ones after eating or brushing. Only wearing your elastics occasionally will prolong treatment and also cause any tenderness to persist. You may experience some tenderness when first wearing elastics, but the tenderness should subside after a few days. Over the counter medications like Ibuprofen should help, but if the soreness continues more than a week, please give us a call. If an elastic breaks, please replace both the broken one and the adjacent elastic to ensure the same amount of force is applied on each side. You should always carry extra elastics with you in case one should break. If you think you might run out before your next appointment, please stop by our office for more elastics, or give our office a call, and we can mail extras to you. Wear a mouth guard when playing sports to protect the mouth from injury. Interdental or Proxabrushes fit between teeth and help patients to clean around wires without damaging them. Non-medicated orthodontic relief wax can be placed over brackets or wires that may be irritating gum tissues. Antibacterial Mouthwash can be used to reduce inflammation and prevent infection. For minor sores in the mouth, Peroxyl, an antiseptic rinse containing hydrogen peroxide may be used up to 4 times per day after brushing. Refer to the product label for specific instructions. Sterile tweezers can be used to replace orthodontic rubber bands that have come off. A Q-tip or pencil eraser can be used to push a wire up against a tooth if it has come loose and is irritating the cheeks or gums. If it is not possible to reposition the wire so it is more comfortable, place wax over the end of the wire and call our office so that we can set a time to have the wire adjusted and put back into place. If you have pets, don’t place your aligners anywhere that your pets can reach them. Pets are attracted to saliva and would enjoy chewing on your Invisalign® trays!